What is the meaning of heat in physics? Heat energy is the movement of atoms or molecules in various states of matter from one object to another object that are in different temperatures. What is the science of heat? energy is transferred from the object with the higher temperature to the object that has the low er temperature. The form of energy being transferred is thermal energy. What is an example of heat? Around us, we see that most popular example of heat is the Sun, which radiates heat to warm up the earth. A burning candle is a source of heat energy. Thermal energy is particles in a substance that are kinetically charged. Temperature: It is not how hot or cold something is. Hot and cold are relative. All matter is made of particles that are constantly moving. The more the particles move, the more kinetic energy, therefore, higher temperature. 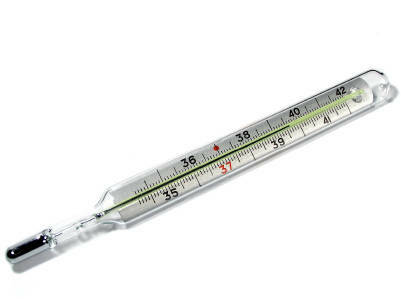 Thermometer: Thermometer measures temperature due to thermal expansion. Thermal expansion is an increase in the size of a substance due to its increase in the temperature. As a substance’s temperature increases, its particles move faster and spread out. There is more space between them making it expand. 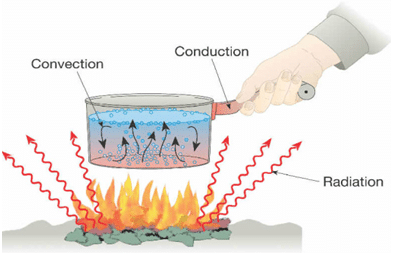 Thermal conduction is the transfer of thermal energy from one substance to another through direct contact. Substances that have a tendency to conduct thermal energy well are called good conductors. Example: iron, copper. Convection is the transfer of thermal energy by the circulation or movement of a liquid or gas. Radiation is the transfer of energy as electromagnetic waves. States of matter are the physical forms of matter, which include solid, liquid and gas. A change of state is a change of a substance from one physical state to another. Heat can be involved in both physical changes (change of state) and chemical changes. 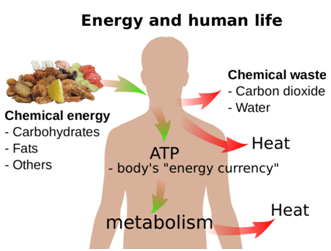 Energy that our body can use is released when chemical compounds such as carbohydrates are broken down. Energy is released in chemical reactions. By looking at the CALORIES on the nutrition label we get to know how much chemical energy is present in a particular food. The calorie is the unit of energy in food = a measure of heat. A calorimeter is a device that measures heat. …………………… is the energy transferred between objects that are in different temperatures. Energy moves from the object with the ……………… temperature to the object that has the …………..temperature. Thermometers can measure temperature due to ………………………………….. Radiation is the transfer of energy as ……………………… waves. Thermal conduction is the transfer of heat energy by the process of collision of atomic particles from one substance to another through direct contact. 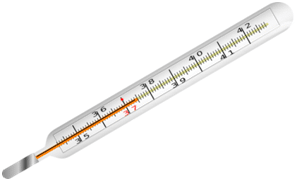 Temperature is a measure of the average potential energy of the particles in an object. Thermal expansion is an increase in the size of a substance in response to a decrease in the temperature of the substance. Convection is the transfer of heat by the mostly in liquids and gases by circling motion.